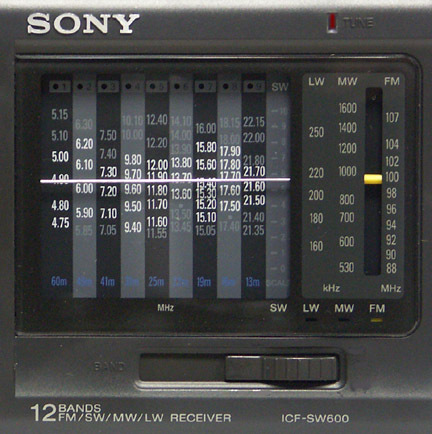 The Sony ICF-SW600 is a analog portable longwave, AM, FM and shortwave receiver. Shortwave coverage is: 4750-5060, 5900-6200, 7100-7350, 9400-9990, 11600-12100, 13570-13870, 15100-15800, 17480-17900 and 21450-21850 kHz. 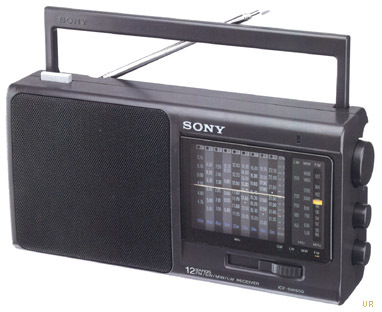 This radio features a large 4 inch (10 cm) speaker, tone control, LED tune indicator and integrated AC transformer. There is a mono earphone jack on the left side. The carry handle swings down into the rear panel. Also operates on four AA cells (not supplied). 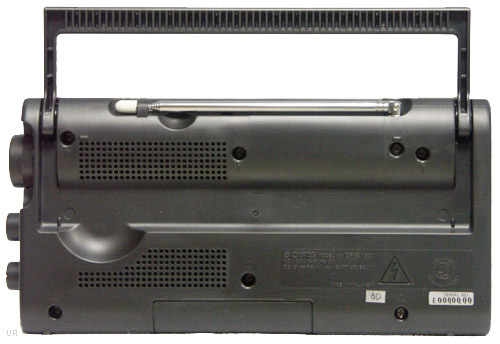 Supplied accessories include: AC cord and Sony Wave Frequency List. 10.5 x 5 x 2.5 inches 2.5 lbs. (226x129x61mm 1030g).